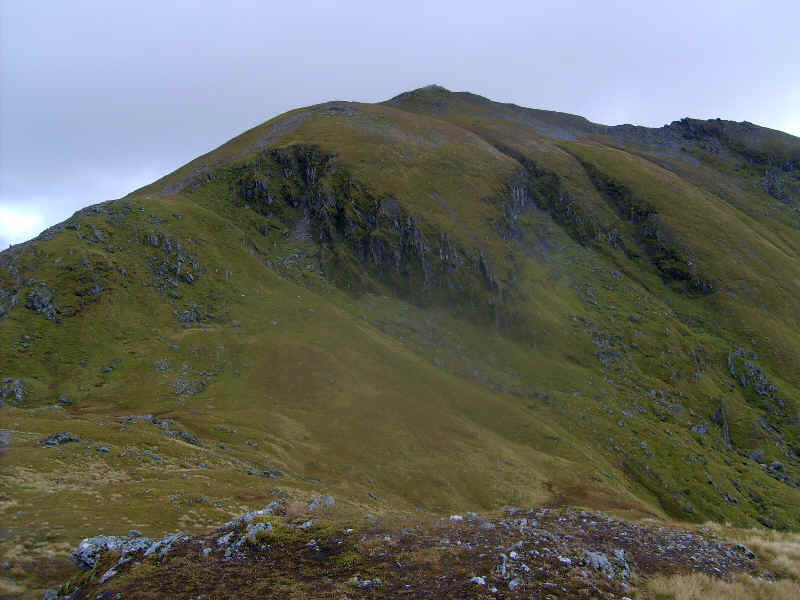 For my second day's walk based at the Ben Lawers Hotel I decided to try to climb the remaining three Munros in the Lawers group - Beinn Ghlas, Meall Corranaich and Meall a' ChoireLeith. 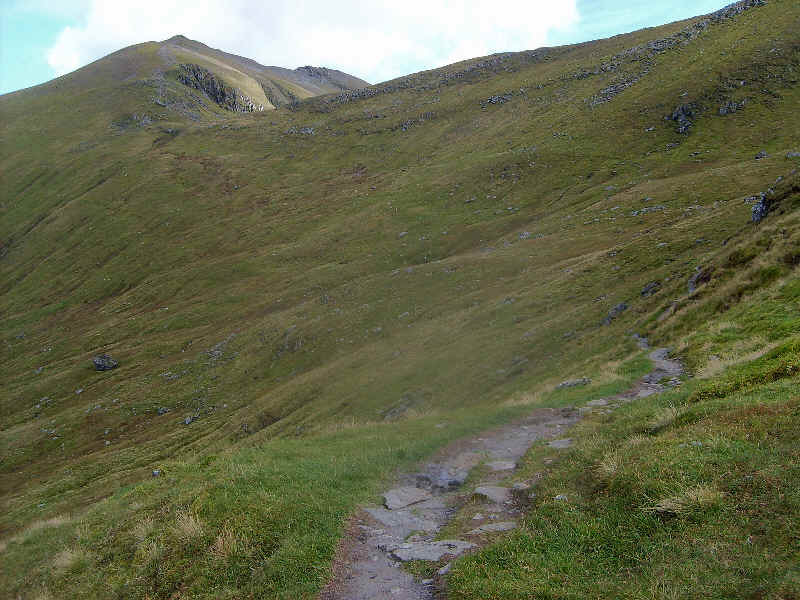 However, my route card suggested that it might be difficult to get to Meall a' ChoireLeith and back in the time I had available, before it would get dark. 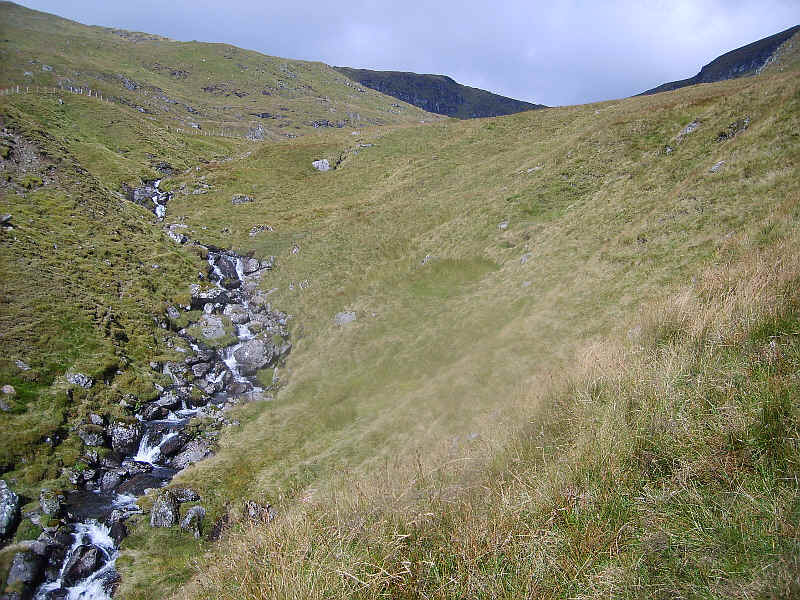 The plan was to walk along the A827 road from the Ben Lawers Hotel to Tombrek and then use the hydro track to climb up to the 600m contour and walk up by the Allt an Tuim Bhric burn to get to the col between Ben Lawers and Beinn Ghlas. 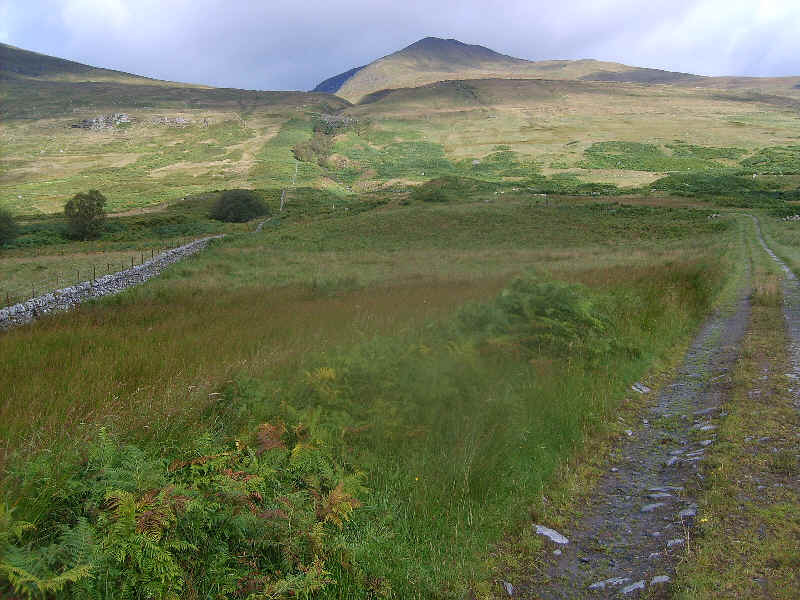 Walking along the road took half an hour and, whilst the verges are narrow, the road is quiet and there was no difficulty stepping out of the way of traffic. 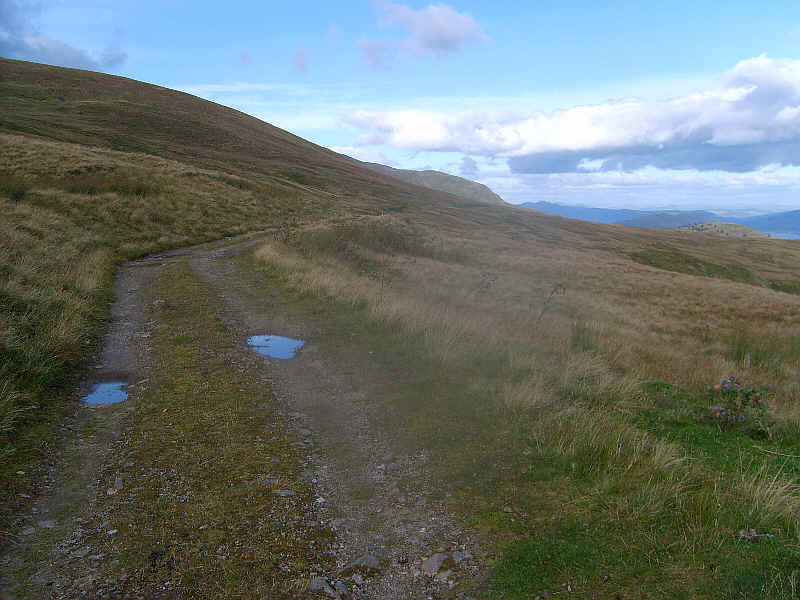 For those wanting to do this walk by public transport the Killin to Aberfeldy service would, I'm sure, stop at the entrance road to Tombrek farm. A few of the photographs are not up to the usual standard as a little moisture had collected inside the lens of my camera because of the previous day's heavy rainfall. 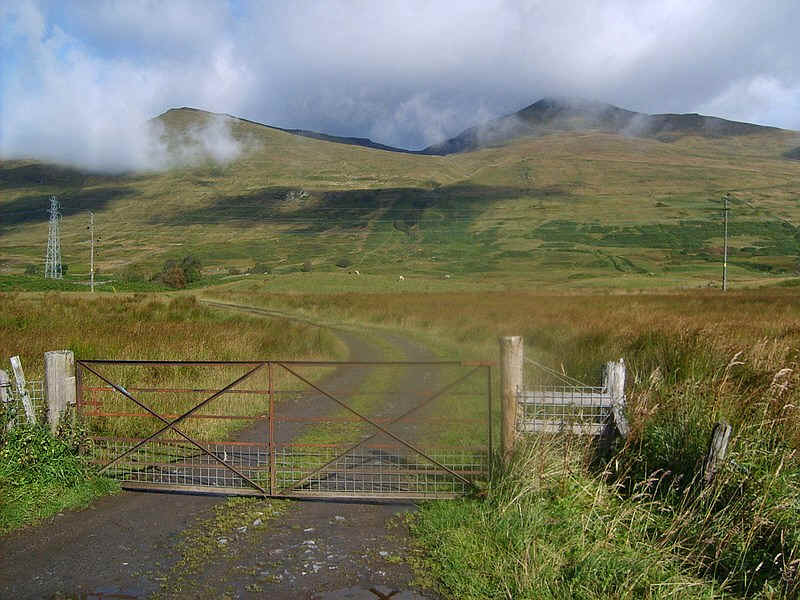 My route started at this gate (NN651379). 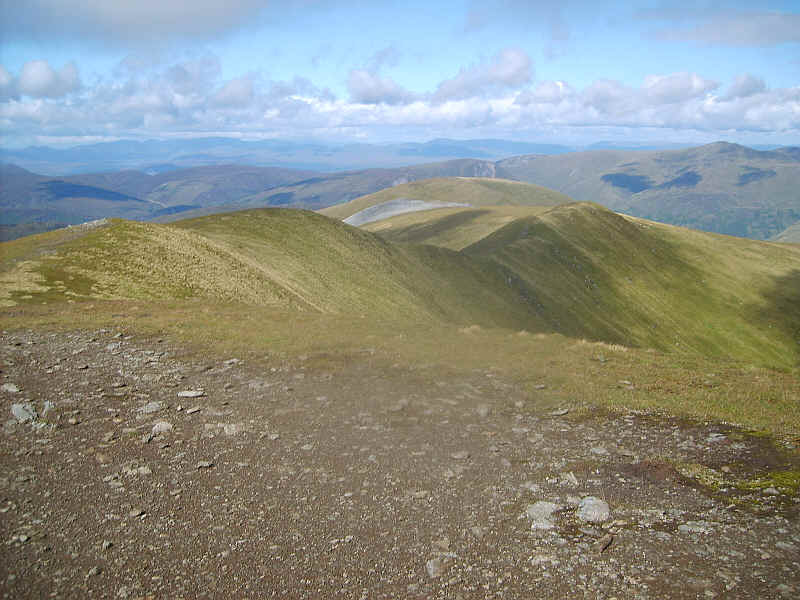 Beinn Ghlas is to the left and Ben Lawers on the right. 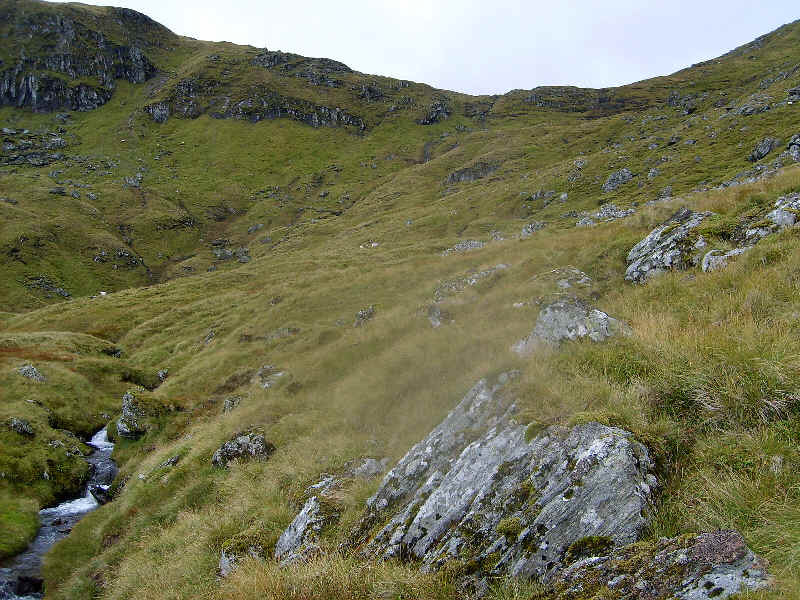 ......but soon starts to climb and zig zags up the hill. 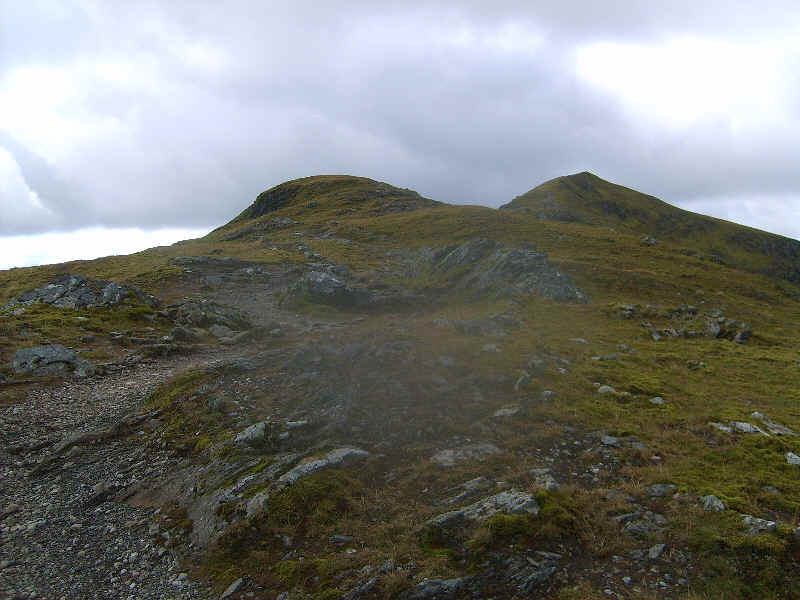 Over to the east are the slopes of Meall Odhar. 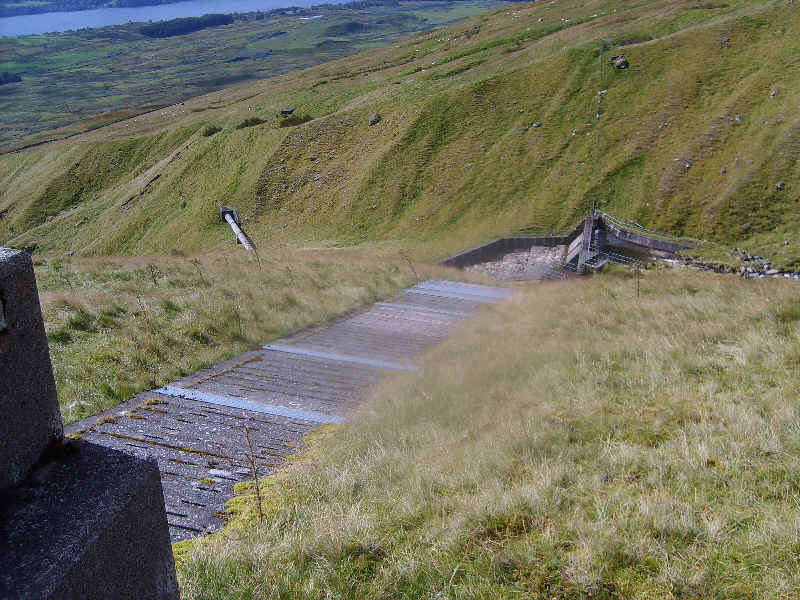 .....reach the water pipeline that drops down to this dam. 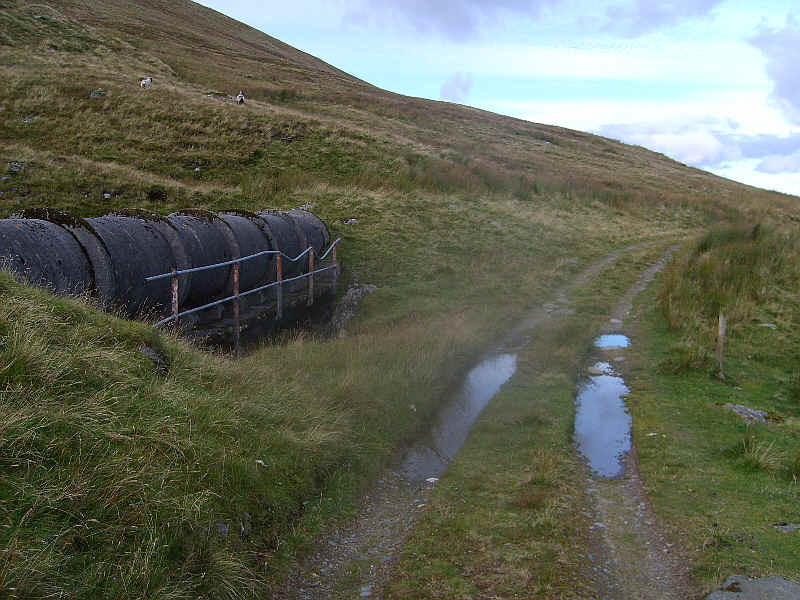 There is an easier way up as far as here - continue on the hydro road a little further than I did, where it meets a track that comes up to this pipeline access point. See the end of this report for photos. 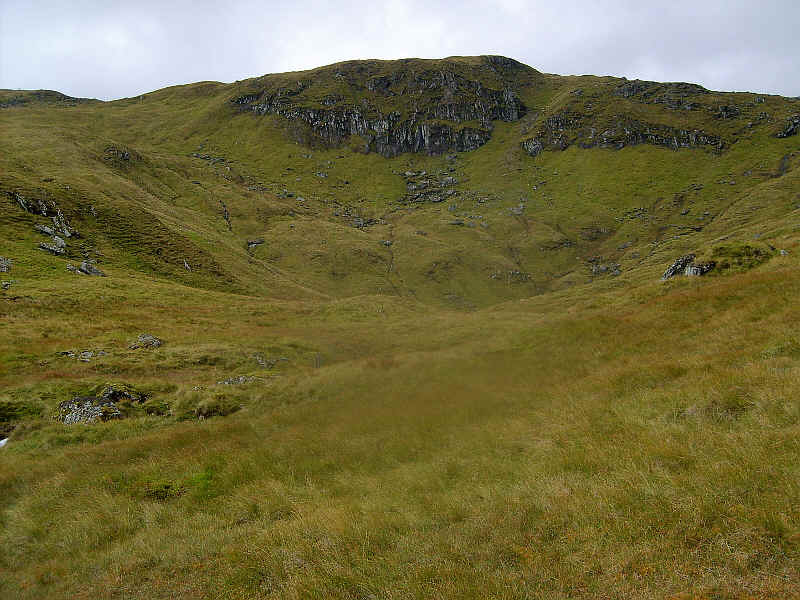 ...and soon enough the corrie at the head of the burn is reached with the cliffs of Creag nan Gabhar dominating the landscape. From here going gets a little harder as the headwall of the corrie is quite steep, but it's simply a case of making for the low point on the skyline. 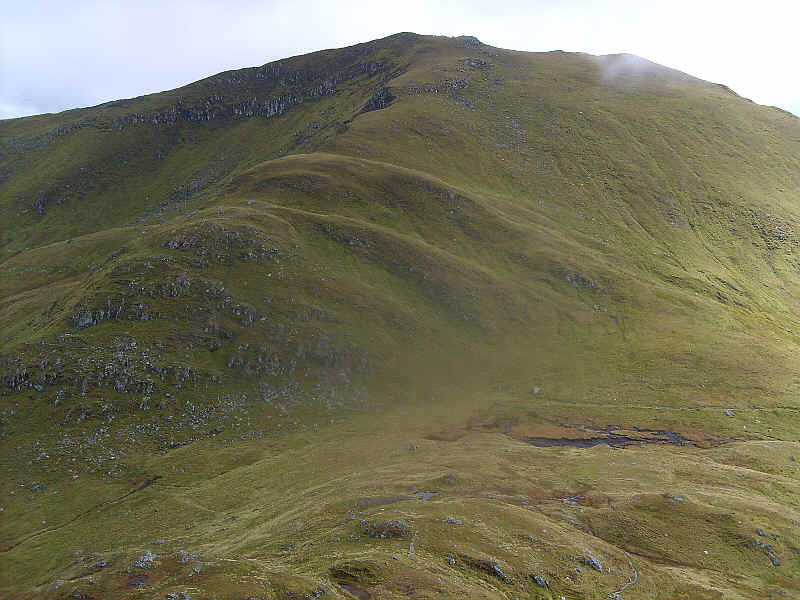 Looking backwards, the bulk of Ben Lawers towers over 250m above the bealach. 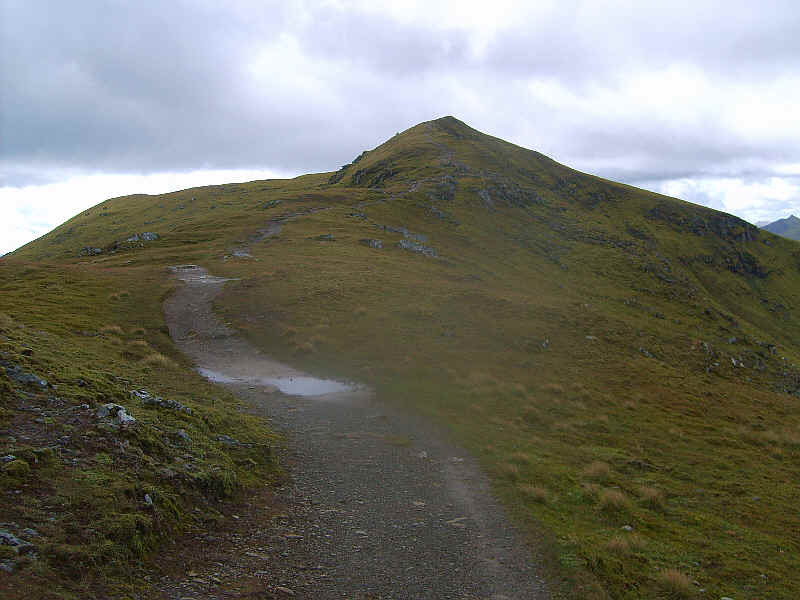 .....with another glance back to Ben Lawers. 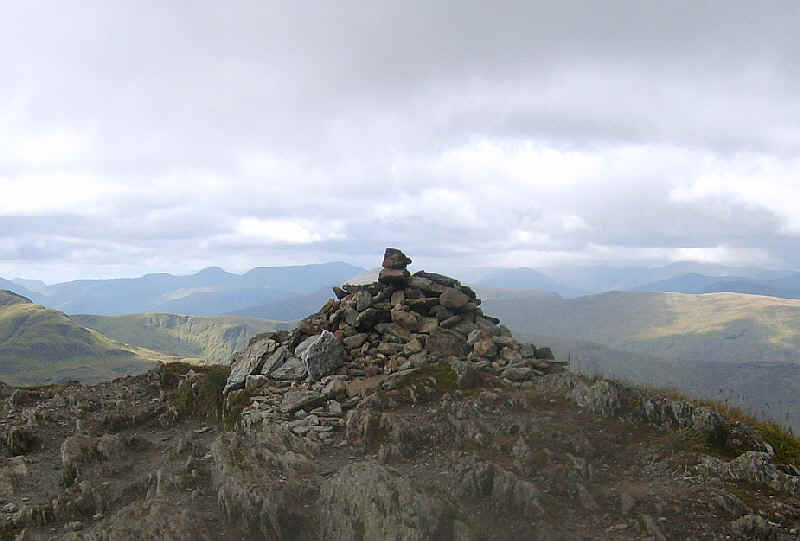 .....to reach the summit cairn at 1103m. 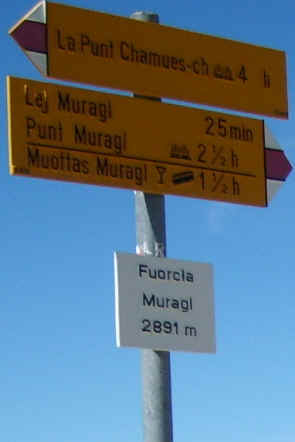 I'd reached the summit exactly three hours after leaving the road. 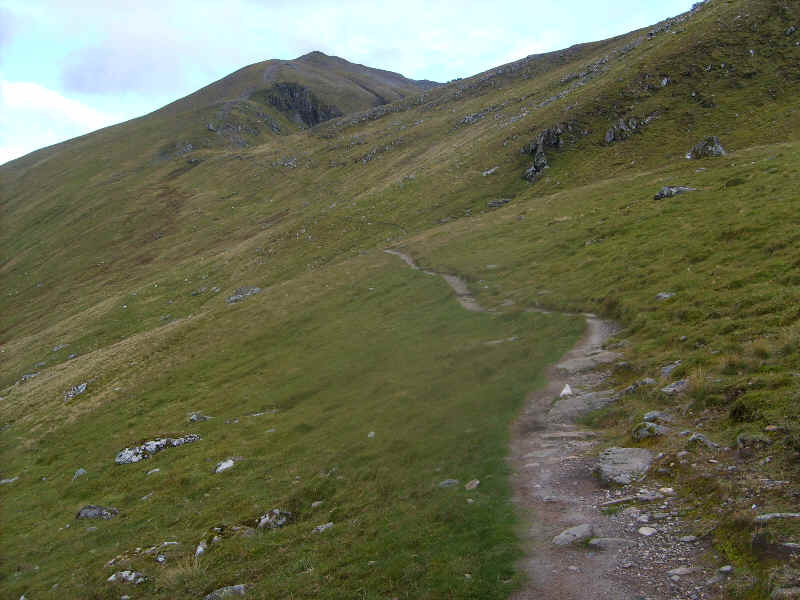 There is a path, of sorts, down the north west ridge of Beinn Ghlas, which would take me to the next Munro seen directly ahead, Meall Corranaich. 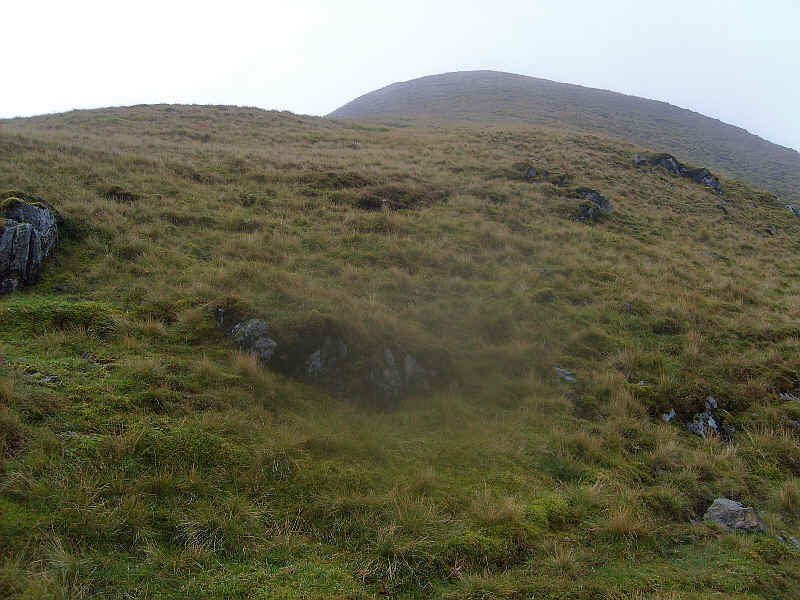 .....until this point where it disappears over quite steep slopes. 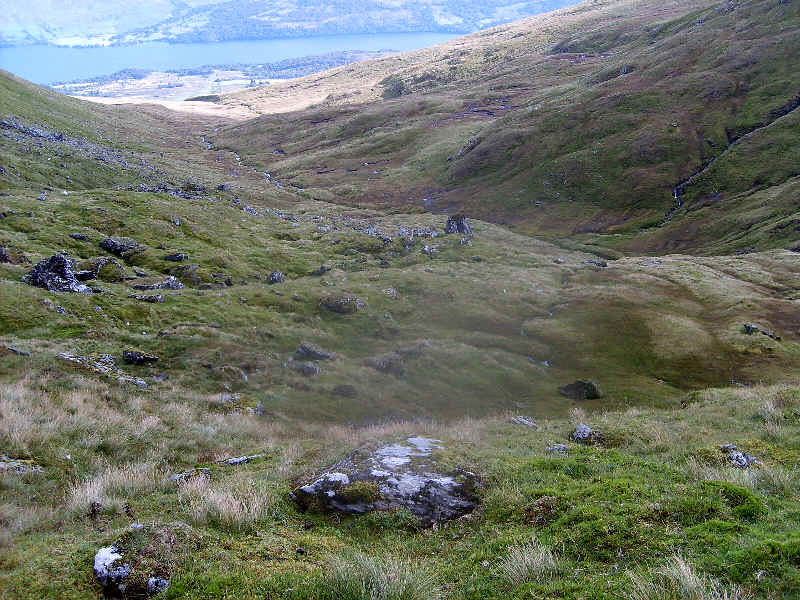 However, there were clearly several possible routes down and I could see the path I wanted down below. 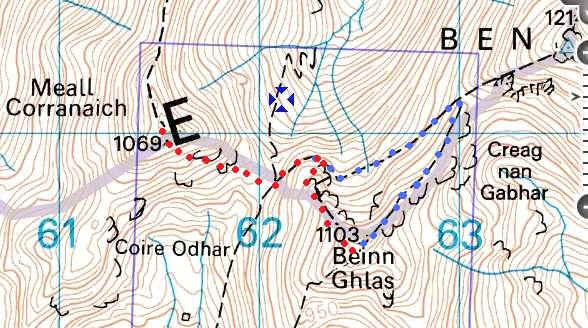 In some ways I think it would have been a lot easier to have headed back to the bealach following the route shown in blue dots, rather than going down the north west ridge as shown by the red dots of my route. 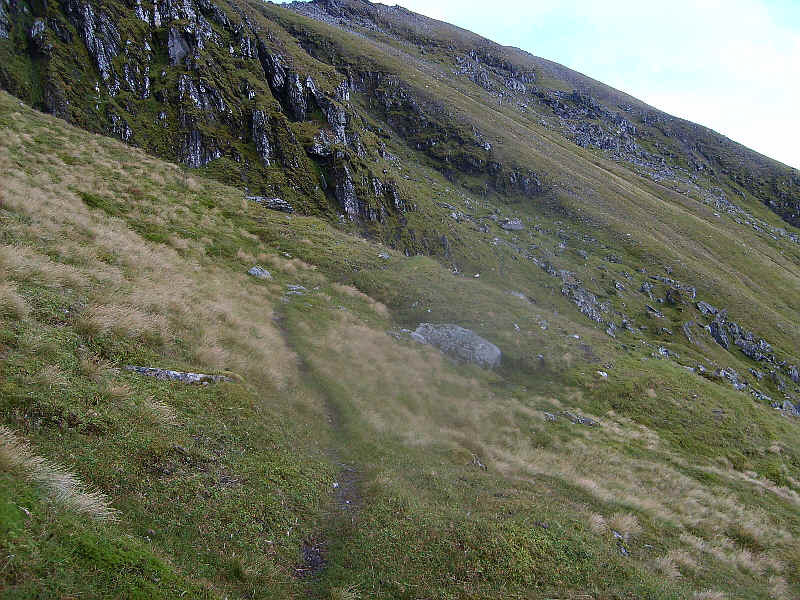 Eventually, I found a way down off the ridge and onto the path that goes to the bealach between Beinn Ghlas and Meall Corranaich. 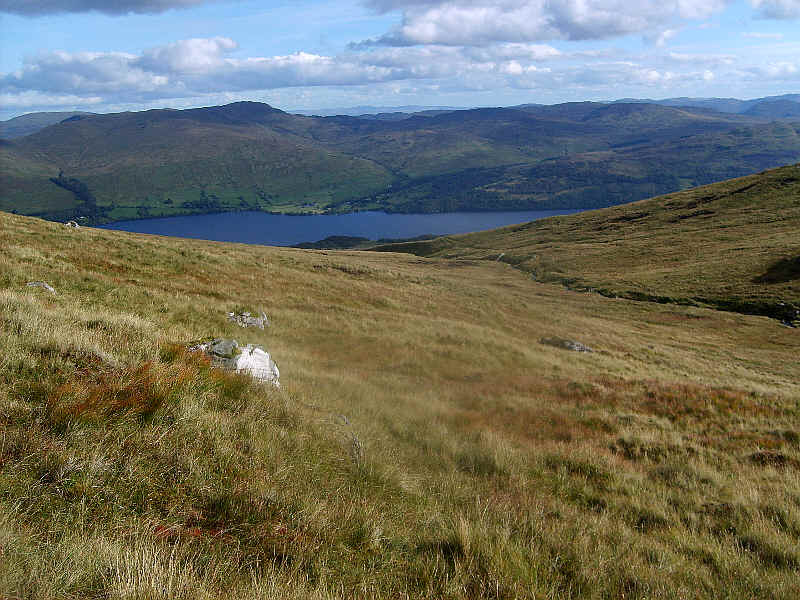 ....and then onto the upper grassy slopes of the hill. 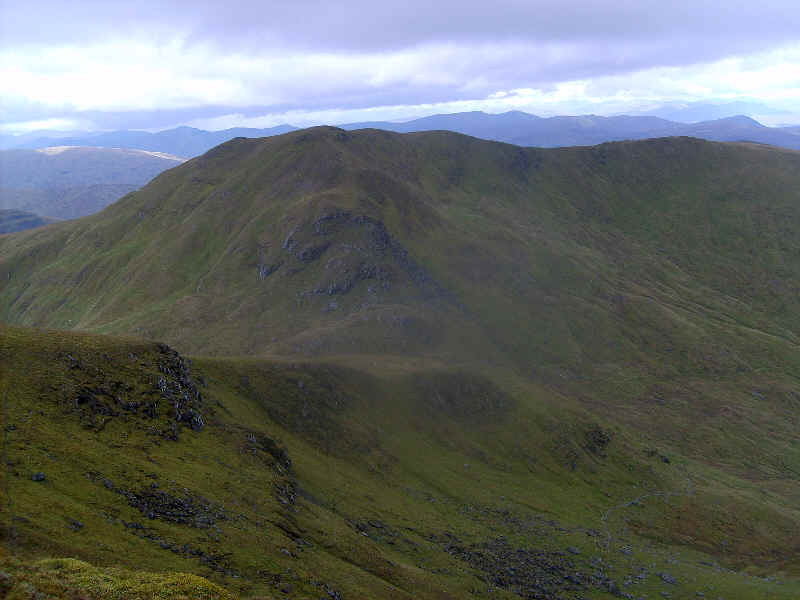 Fortunately, the squall passed quickly and I was rewarded with this view of Beinn Ghlas and the ridge I'd come down. 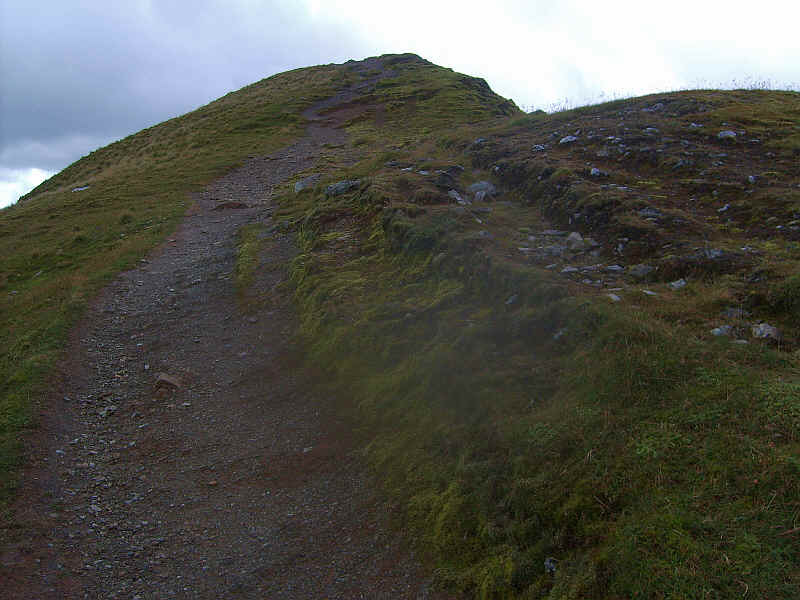 The path continued to the summit cairn with its pile of stones and old metal fence posts - definitely not worth a photograph! It was now 2pm and it had taken me almost five hours to get to this point. 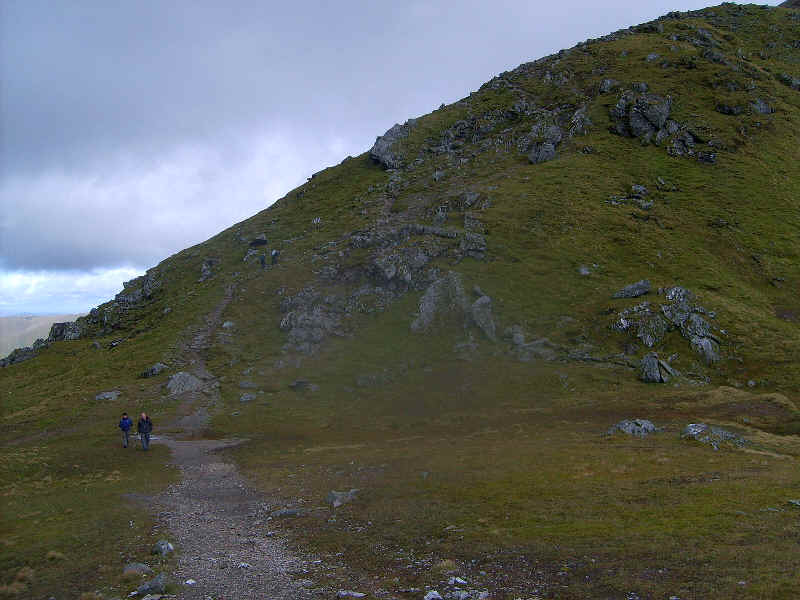 To go on to Meall a' Choire Leith and back would probably take at least an hour and a half. Then to get back to the hotel would take about another four hours. Clearly I wasn't going to arrive there before 7.30 and that meant I'd be walking along the road at dusk. For once the decision was made for me. 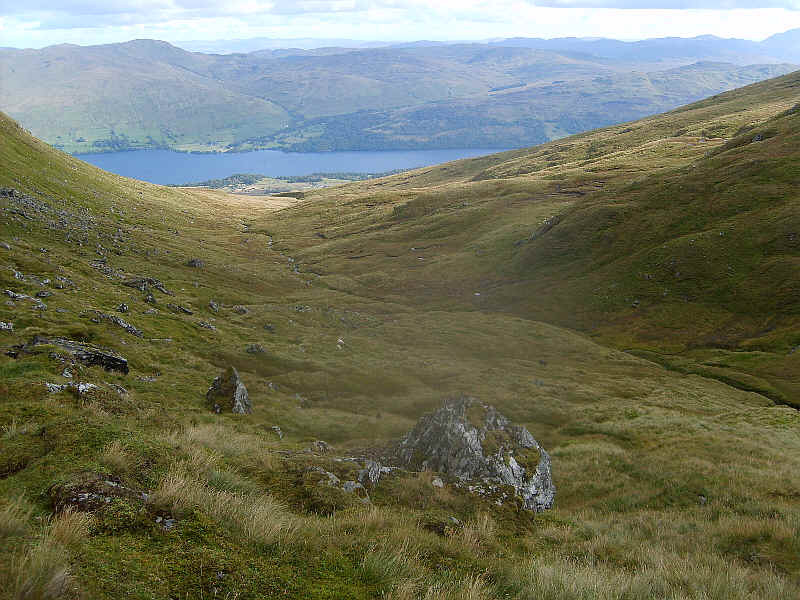 It was time to turn back and leave that Munro for another day. 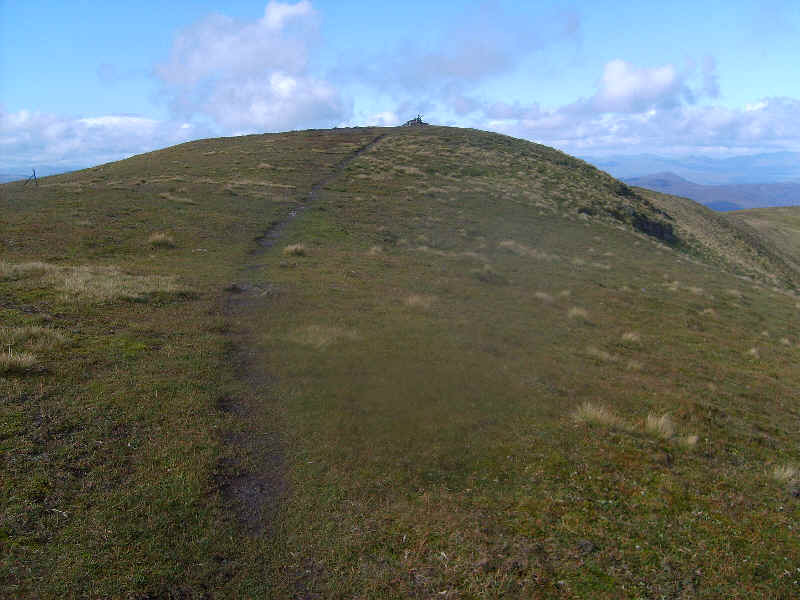 I walked a little further beyond the summit and took this photo looking along the ridge towards Meall a' Choire Leith, the domed shaped grassy hill, which can be seen in the distance. By now the weather had improved so a short ten minute's break, a good look at all those mountains, something to eat and all was well with the world! The route back was different to my outward one so this map is included. 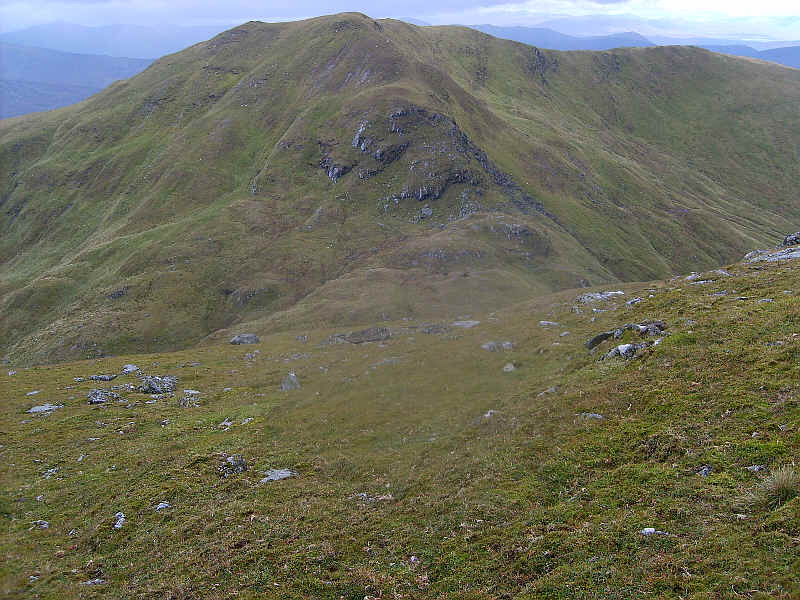 Click on the photograph to see this panoramic photo of Ben Lawers and Beinn Ghlas from the summit of Meall Corranaich. 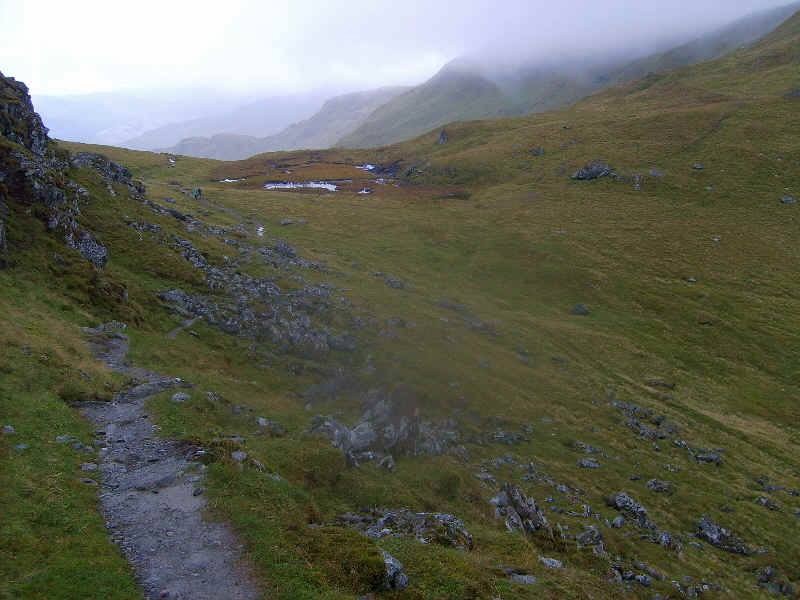 After dropping of the hill I took the delightful path up to the bealach between Ben Lawers and Beinn Ghlas (the one in blue on the map). 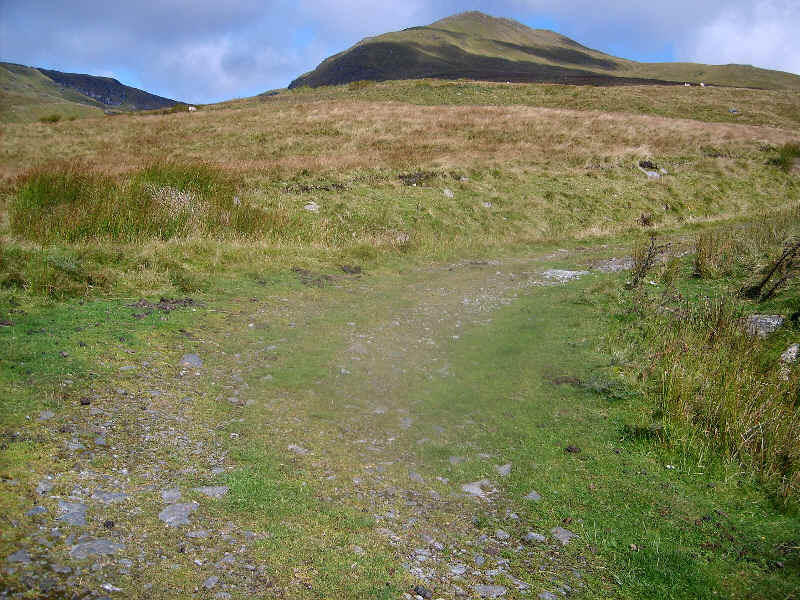 In many ways this path reminds me of those superb mountain paths in Switzerland. 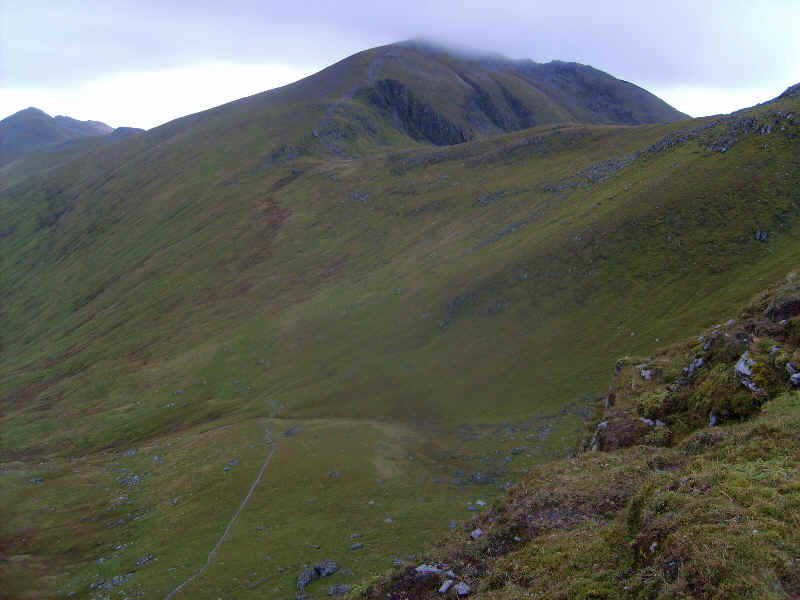 On the climb up to the bealach this is the view of Coire Liath with Meall a' Coire Leith on the left and Glen Lyon beyond. 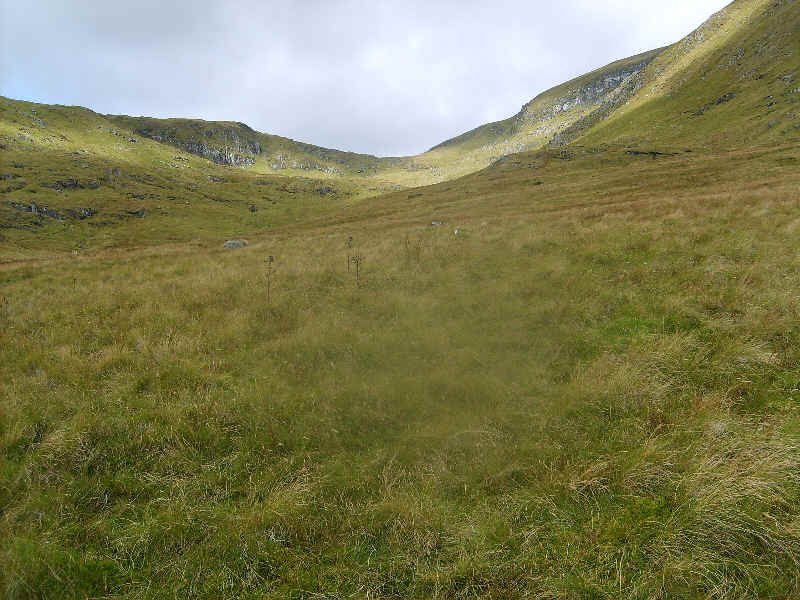 At the bealach there's a faint path on north east side of this lochan..
.....and so it is simply a matter of finding your way down the grassy slopes. 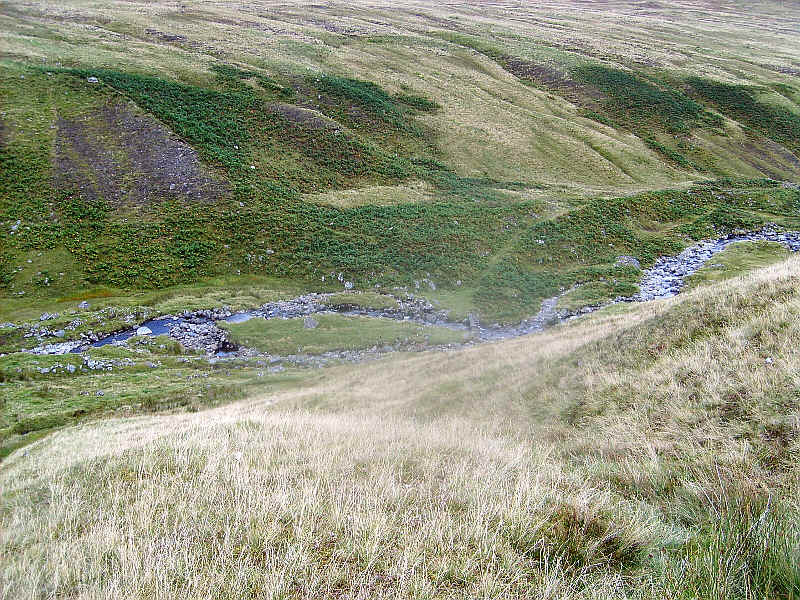 By now it was a pleasant early autumn evening and what better way to spend some of it than walking next to a burn. 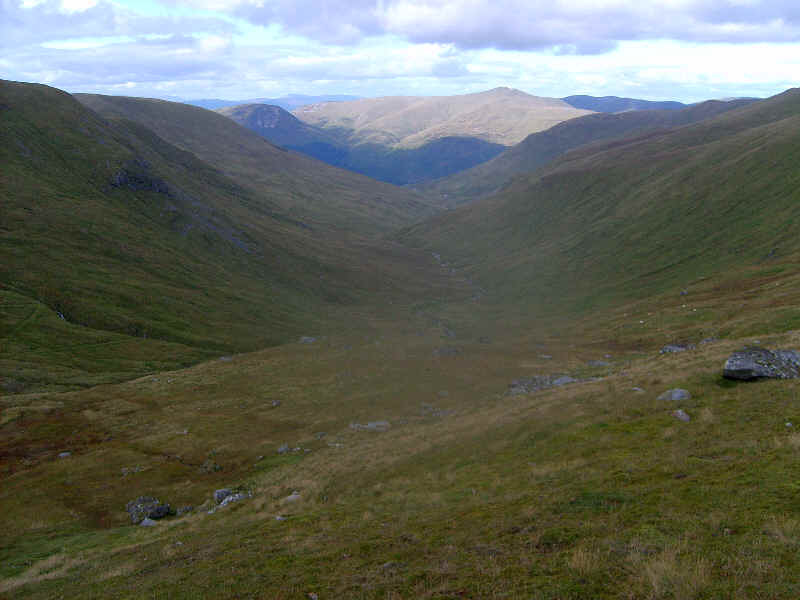 When the Allt an Tuim Bhric begins to descend more steeply I kept on drier ground a little higher up heading for the pipeline and dam. 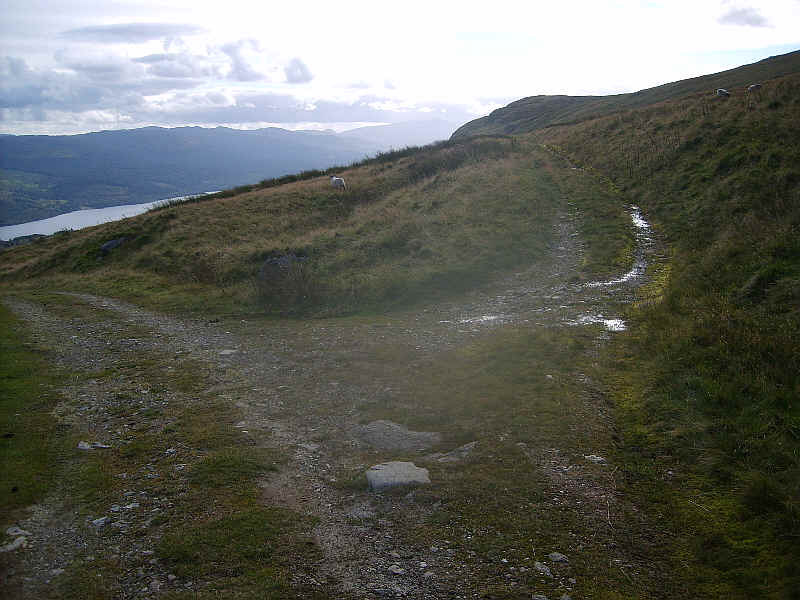 Once there I noticed a vehicle access track, which led off to the east. 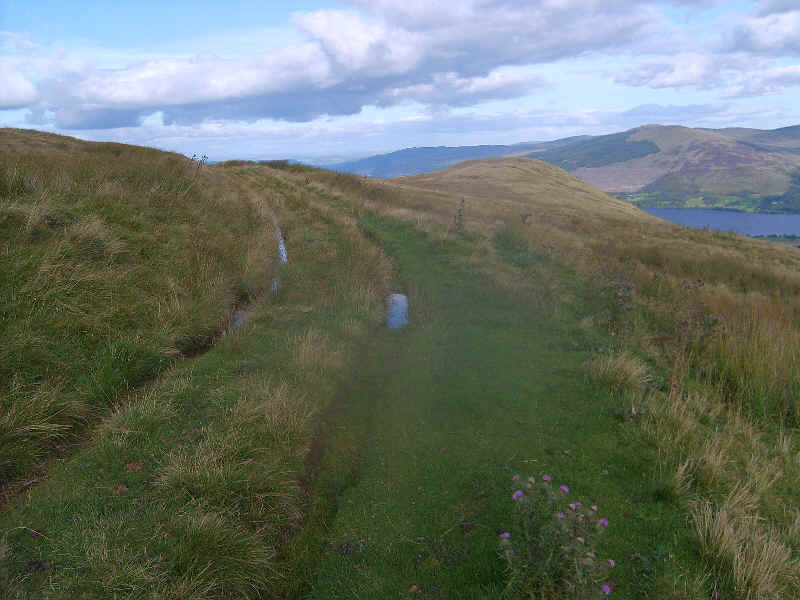 Rather than going down the hillside to the hydro road I thought this would be easier. 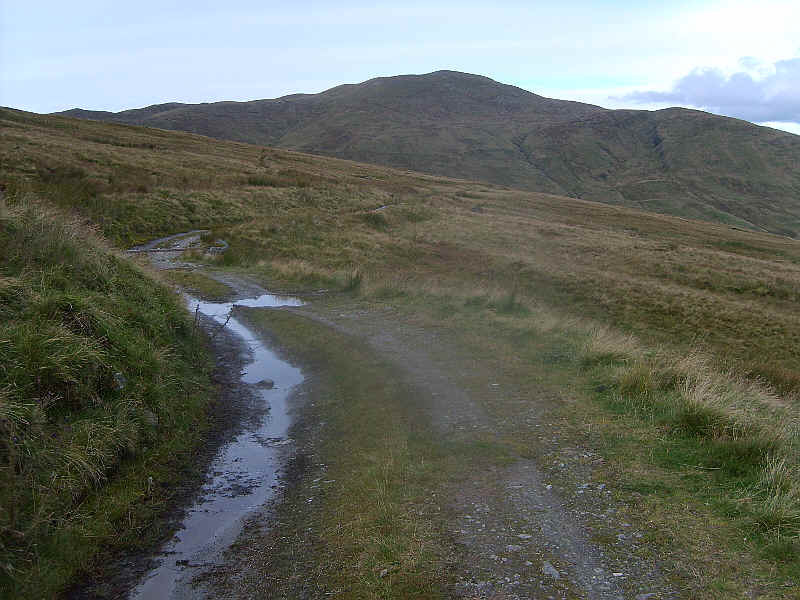 It then occurred to me that it would be more pleasant to use the hydro road to get back to the Lawers Burn and then down to the Ben Lawers Hotel, rather than walking along the road again. 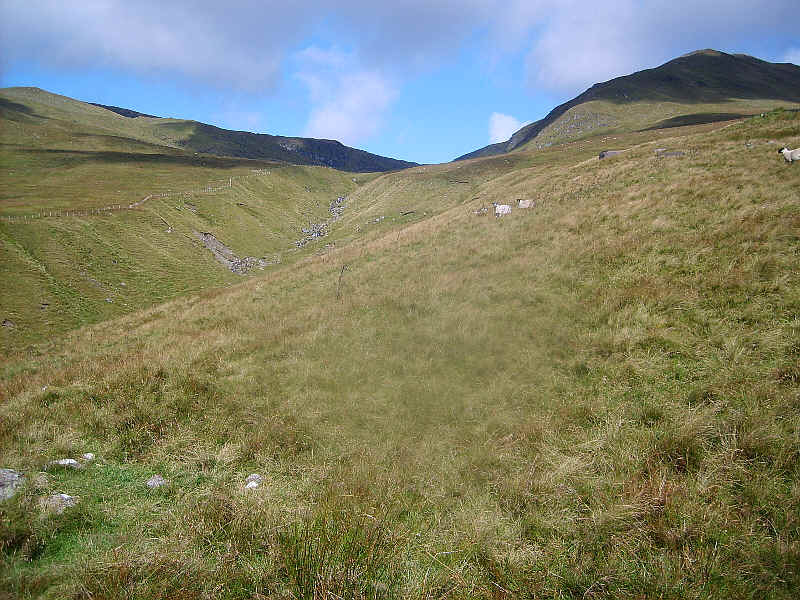 A National Trust worker that I'd met had said that the hydro road seemed interminable but I thoroughly enjoyed it. The road is almost level and there are occasional signs of the pipeline and overflow channels to add a little interest. 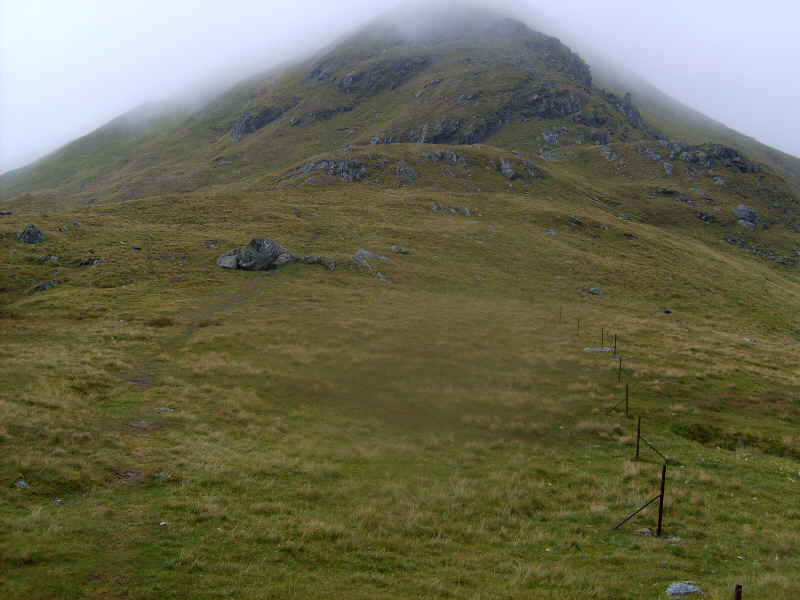 As I got nearer to the Lawers Burn I decided to cut directly across the hillside to the footbridge I'd used the day before, when coming down from Ben Lawers. 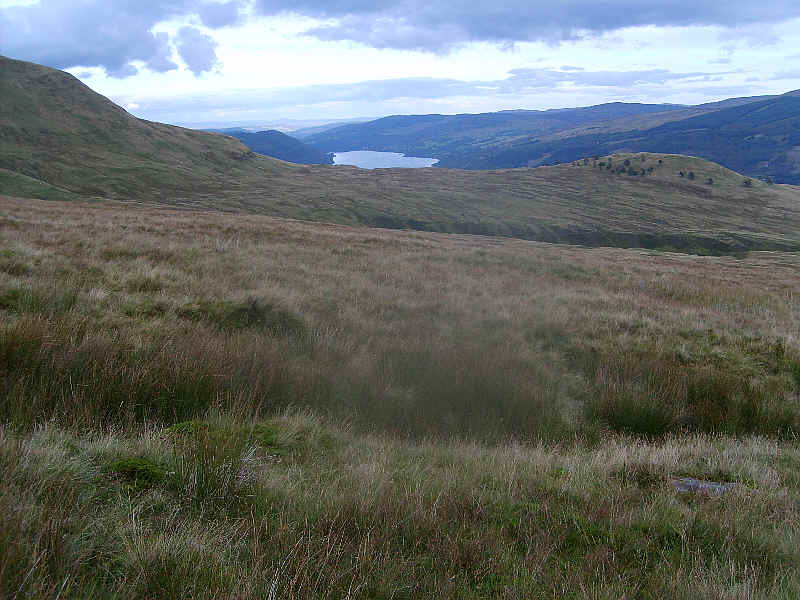 I set my GPS to the footbridge's grid reference and used the GPS to show me when I came to the closest point to it across the hillside. 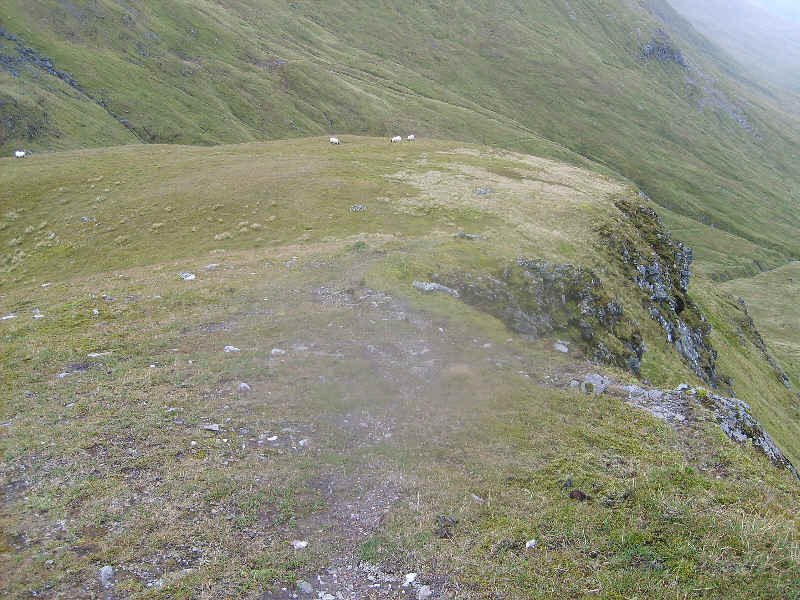 The tramp across the hillside was exactly a kilometre and surprisingly was quite dry, with only a few damp patches. 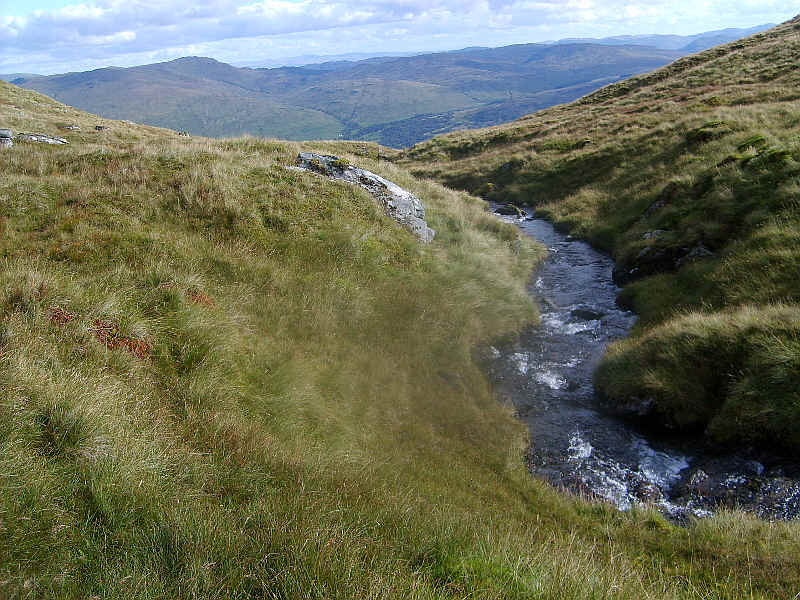 The GPS led me directly to the Lawers Burn with the footbridge visible below. 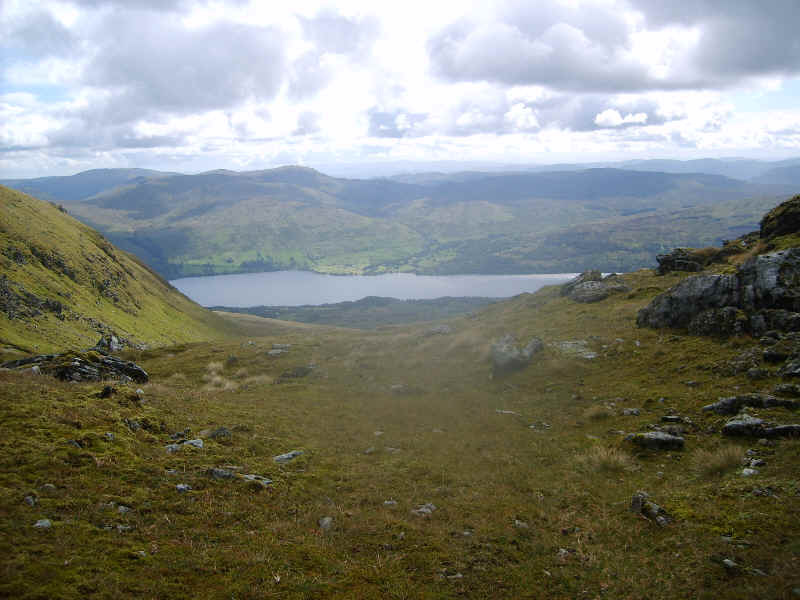 I arrived back at the hotel at 6.45 having taken about three and a half hours from the summit of Meall Corranaich. 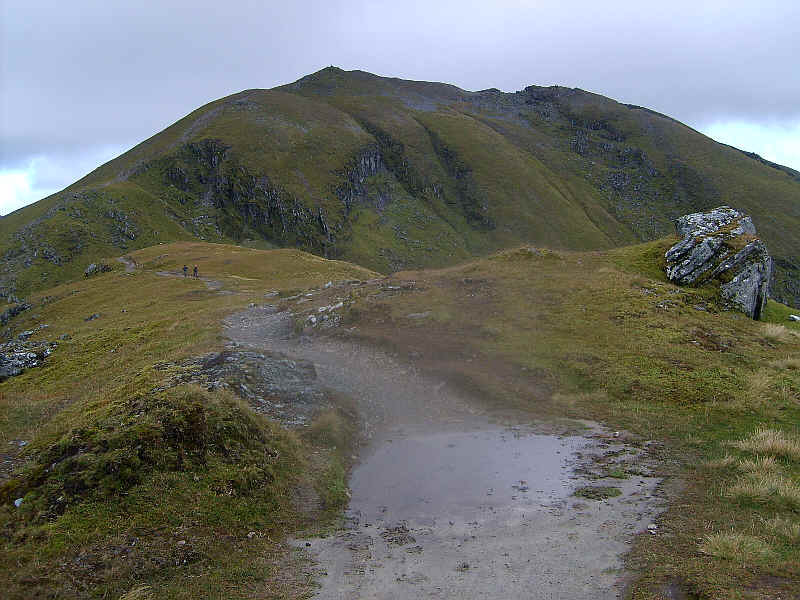 Could I have reached the third Munro of the day and got back before dark; possibly, but I'd have felt under considerable time pressure. I should have left earlier in the morning! !